← Spotlight on Grapple. The fruit, not the Judo move. Chicken Fingers Bento, yet again! Year in, year out, being typical Filipinos, there’s one sure thing that can be said in our house during the first few days of the new year. There’s an overabundance of fruit! So one look at this bento and you know—Kao’s behind on her bento posts again! Ever the lazy cook, for this bento, I simply took some ready to fry chicken fingers from Magnolia. I can’t stop raving about this instant food because it’s yummy and reasonably priced. I usually skip their packaged dressings though because I like neither flavors. In place of that, I packed along a small container of mushroom gravy, made from scratch by my mom. For carbs, I reheated some leftover garlic mashed potatoes. It’s prepared much like how you do normal mashed potatoes, only I used garlic butter in lieu of plain butter. Also included are asparagus spears, also lightly cooked in more garlic butter. 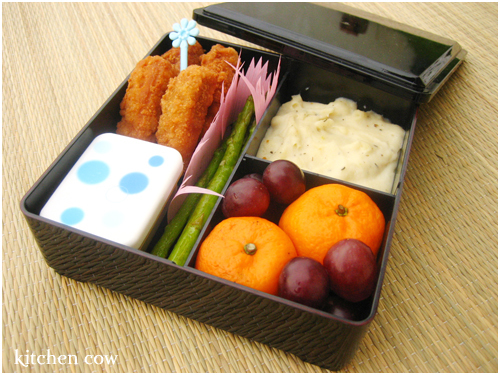 6 Responses to Chicken Fingers Bento, yet again! Mmm the asparasgus looks wonderful! Do you usually bake or fry your chicken fingers? Fried, sadly. ^_^;; I know it’s unhealthier but I just couldn’t resist. Plus, I guess it’s impractical for me to fire up the oven to cook 4 small chicken fingers. Maybe if I were cooking a full-scale dinner. Oh, is this for the contest? Do you mind moving this to the contest post so it could be counted? Thanks!